The New Horizons spacecraft that spun by Pluto about six months ago is more than 120 million miles past the dwarf planet and moving at 32,000 miles per hour. Astronomers may have decided that Pluto isn’t technically a planet anymore, but space enthusiasts everywhere still see it as one. Even Alan Stern, who directs the New Horizons mission that has recently measured and photographed Pluto, thinks Pluto is more like a planet than not. He recently said that Pluto is more like the eight official planets in our solar system than it is like anything else. What we’re finding out from New Horizons is that Pluto is, in fact, much more like a planet than we knew and that it’s complicated. Pluto has glaciers of ice like other planets in this solar system, for example, but the glaciers are made of nitrogen ice, not water ice. Earth has a razor-thin atmosphere compared with the size of the planet. About 80% of all the oxygen available to breathe on Earth is found in the first 5,000 feet above sea level. 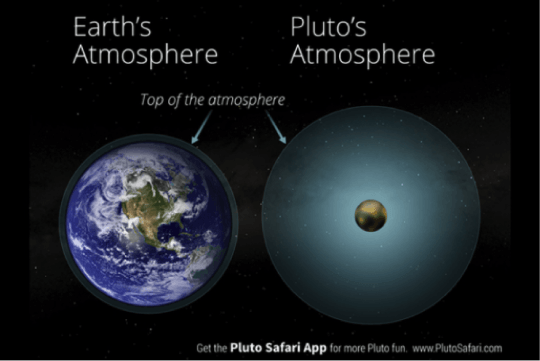 Pluto, by contrast, has an atmosphere that extends hundreds of miles into space. Pluto has an atmosphere, a haze never seen before New Horizons discovered it, that rises hundreds of miles above the surface. 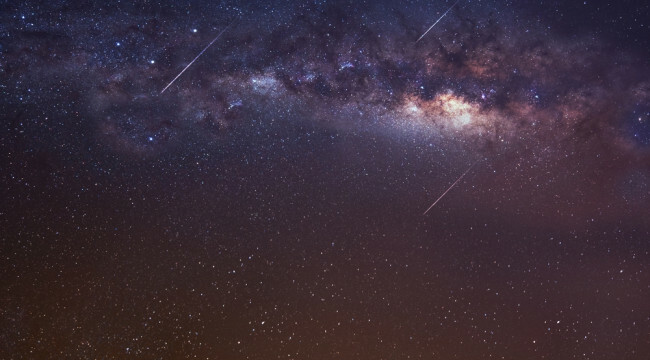 It’s relatively thick compared with Earth, unlike Earth’s meager and razor-thin atmosphere, especially compared with the surface area of the planet. Pluto’s atmosphere has 350 times more volume than the dwarf planet itself. Like Earth, Pluto’s atmosphere is mostly nitrogen, with small amounts of carbon monoxide and methane. All three elements probably sublimate into the atmosphere from the ices that are known to exist on Pluto’s surface. Almost any gas would turn to ice easily on Pluto because temperatures range from minus 350 degrees F to minus 400 degrees F.
Because Pluto is deeply tilted on its axis at 120 degrees and because it orbits the sun in an ellipse instead of a circle, it undergoes significant seasonal changes. Gases that are frozen in winter evaporate or sublimate during summer days and rise into the atmosphere, only to frost out at night. Thus, the planet has forces that shape its geology and is not “dead,” as often described. Pluto’s largest moon, Charon, is thought to have been formed the same way Earth’s moon was — by impact from a large asteroid. The New Horizon’s mission didn’t spend long zooming by Pluto, but it came very close by and it carries lots of instrumentation. Downloading all the data and then interpreting them will take years, but as the data dribble out and we learn more about Pluto, it is turning out to be far more interesting than the large frozen rock it was once thought to be. It’s more like a planet. Stephen Petranek’s career of over 40 years in the publishing world is marked by numerous prizes and awards for excellent writing on science, nature, technology, politics, economics and more. He has been editor-in-chief of the Miami Herald’s prestigious Sunday magazine, Tropic, and has covered a wide range of topics for Time Inc.’s Life magazine. His presentation 10 Ways the World Could End is one of the most original and most watched TED talks of all time.